On our rearranged trip with Delta we were allocated vouchers for an overnight hotel - Comfort Inn at Atlanta Airport. So off we headed to the shuttle bus pick up point to be transported to our hotel. Along with 200 others as an other Delta flight had just arrived late and everyone had missed their connections. At the pick up point there were buses for every hotel you could imagine but no Comfort Inn. So we waited. 10 minutes passed and other buses came and went but still no Comfort Inn. Then a bus for the Double Tree Inn pulled up. This enormous driver stepped out and asked if we wanted Double Tree. I explained I was waiting for the comfort inn shuttle. He asked to see my voucher, and I certainly was not going to argue with him. On looking at it he said: You don't want to be going all the way out there. Double Tree is only 5 minutes away (Not that I knew any better) we will honour that voucher. Get on the bus!" On getting on I found it crammed with people. On talking to them however I couldn't find anyone on the bus who actually had a Double Tree voucher. He had gone round everyone who was standing at the bus station and scooped them all up. They were all heading for different destinations but he "invited" us all on to the bus going to the one destination. The ironic thing was once the bus was full someone with a Double Tree voucher couldn't get on and had to wait for his return. Standing on a crowded bus at 1 am in the morning not knowing where I was going I felt God saying to me evangelism is that simple. It doesn't matter where people are going tell them they will be accepted no matter what where you are going and invite them to get on the bus. 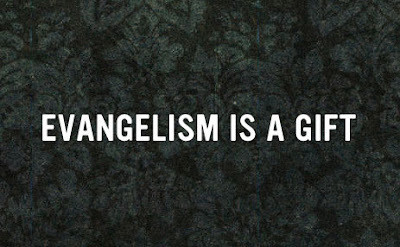 If evangelism is a gift this guy had it in spades.